The vagaries of the East Asian Summer Monsoon (EASM) impact the world’s most populous region. Understanding what drives monsoon precipitation variability is essential not only for understanding its past fluctuations but also predicting how monsoon rains will respond to future, anthropogenic climate change. The EASM occurs because the Asian continent is heated significantly during summer, which causes air to rise, creating a low-pressure zone. Seasonal changes in atmospheric circulation allow warm, moisture-bearing air masses to migrate inland, engendering extreme wet seasons. Approximately 80% of central and eastern China’s total annual rainfall is received during the monsoon season between May and August (see map). Understanding the exact sources of this monsoonal rainfall is important because changes in surface temperature or evaporation at these source locations will impact the levels of rainfall received downstream. Until very recently, little quantitative work had yet addressed this. One existing study is that of Chen et al. (2013), who focussed on the moisture processes of the lower Yangtze River basin. In a recent paper published in Journal of Geophysical Research: Atmospheres, my co-authors and I use an atmospheric model to show that the northern and western Indian Ocean supplies the majority of the moisture that drives China’s present-day summer monsoon rainfall (see graph). 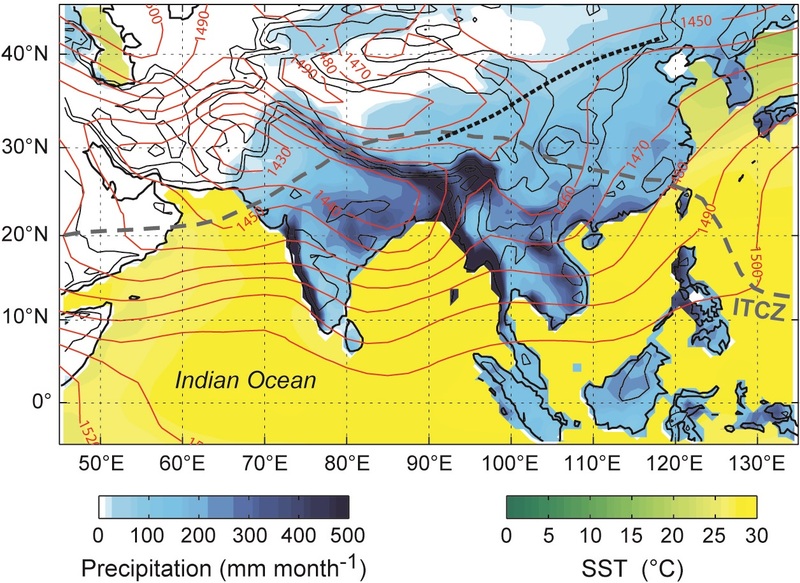 It was known already that these moisture sources are important for India’s summer monsoon, and now our study provides evidence that the Indian Ocean’s influence extends even to easternmost China. Surprisingly, moisture exported to China from the north-western and low-latitude Pacific Ocean during the EASM is relatively minimal, despite their similar proximity and the seasonal occurrence of strong south-easterly monsoonal winds. Replication – obtaining the same result(s) from multiple studies, ideally using multiple methods – is a crucial part of science, and it is encouraging to see that more recent work corroborates our results. For example, Chen et al. (2017) performed an atmospheric water tracing study for East Asia using a global climate model and found that moisture from northern Indian Ocean regions, namely the Arabian Sea and Bay of Bengal, is the dominant contributor to summer precipitation. In a previous blog, I described how oxygen isotopes are used to study past climate. Recent isotope studies of past monsoon variability, including Thomas et al., (2016), Yamada et al. (2016), Chen et al. (2016), Jiang et al. (2016) and Day (2016), use our moisture transport results, and may do so more confidently now that they are substantiated. Perhaps just as important is the insight our study gives into future EASM behaviour. The most up-to-date projections from global climate models tell us to expect Indian Ocean surface warming and an expansion of the region affected by the EASM, both as a result of anthropogenic greenhouse gas emissions. For more information, see Hsu et al. (2013) and Lee et al. (2014). 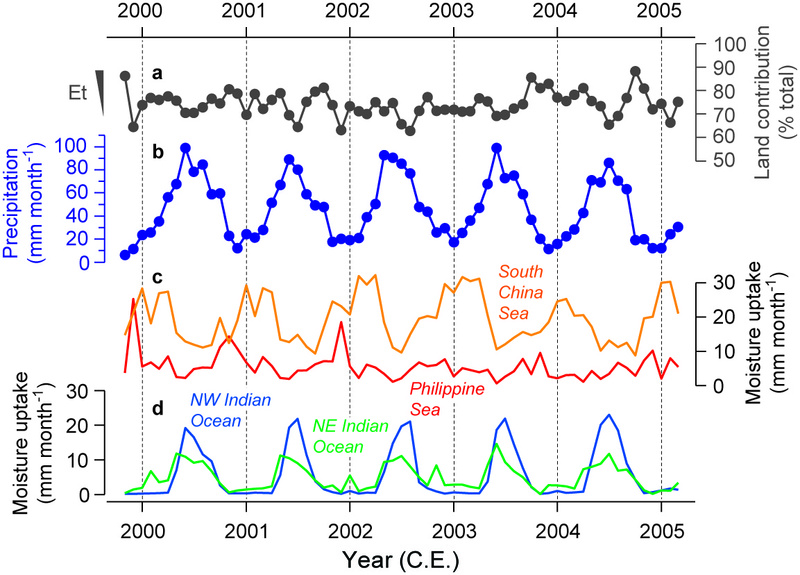 Given that we found this region to be the most important moisture source during the EASM, our study suggests Indian Ocean warming may lead to increased monsoonal rainfall across central and eastern China. While very possible, climate projections for East Asia must also account for changes in monsoonal circulation, aerosol emissions, and the local hydrological effects of land usage. For example, regional aerosol emissions may partly offset greenhouse gas-forced warming. Nevertheless, a quantitative understanding of moisture transport will play a crucial part in predicting how EASM rainfall will respond to anthropogenic climate change and help us to develop adaptation strategies for the agricultural communities that depend on seasonal monsoon rains. Postscript: Some of my collaborators are now developing the capabilities to extend studies like ours from circa five years to multiple decades, enabling future research to address climate change questions more fully. There is particular interest in understanding the response of moisture transport to longer-term sea surface warming. By combining observations, model simulations, and proxy data, we will sharpen our view of future EASM trends and variability. Our paper, along with the raw data, may be downloaded from ResearchGate.